Today we're shining a light on a pair of beautiful torties rescued by our dear friends at Anjellicle Cats Rescue in NYC with the hopes of helping them find forever homes. 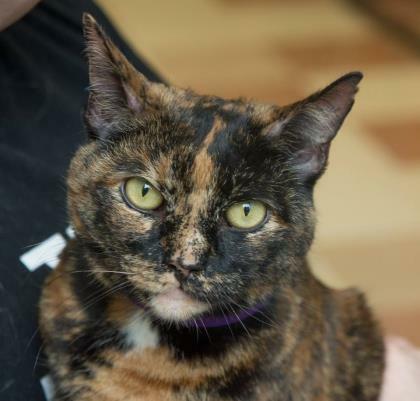 Beautiful Bella is described as a typical grand tortie - she thinks VERY highly of herself, and thinks you should too! She's 10 years old and 16 pounds of pure love. Bella is very afraid of other cats and dogs and would prefer a person all her own, but she promises to keep your lap nice and warm this winter. She wants nothing more than to rule a house and heart...could it be yours? Cuddly Coco is only a year old and was not only recently rescued from a hoarding situation, she has also already been a wonderful mom to a beautiful group of kittens. That's a pretty dramatic story for such a young lady! 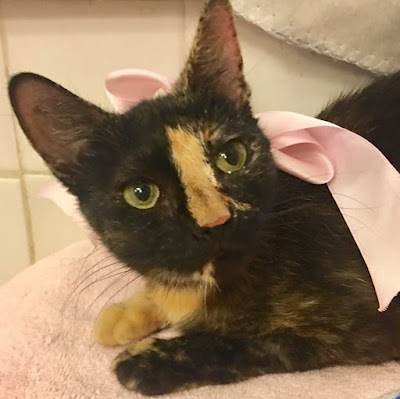 She's gentle and sweet and gets along well with other cats, so she would be happy to be adopted into a home with a friend or two. Interested in adopting Bella or Coco? Contact Anjellicle Cats Rescue today! Such sweet kitties ! We purr they will get loving homes soon!! Aww, I sure hope Bella and Coco quickly find their furrever homes. They are both so adorable, just like me. Those girls are gorgeous! We purr that they find homes soon. They sure are both good looking. Coco, you sure are cute and we wish that both of you find your forever homes too. I hope they find their forever homes. Oh, what beauties Bella and Coco are! Surely these two sweeties won't have to wait long for their forever homes. We are sending them our purrs and prayers. Thank you for sharing them and working to help them find homes, Mudpie and Melissa! Bella and Coco you are both gorgeous looking kitties. We hope they are both able to find their furever homes as soon as possible to a loving family. Thanks for the share, Mudpie. Have a wonderful day. Good luck little ones. Cutie-pies! Folks of NYC, pay attention! If Coco were in my part of the world, I think Queen Serena would welcome *her* as a subject. In my part of the world, I've agreed to foster Midnight Rose (whose human died), directed her friend's human to a neutering program, and (ruefully) said no to Rue. Rue is the Senior Queen of 18 social cats. She's gentle and friendly but her method of discipline has led her human to believe that being Queen is getting on her possibly 11-year-old nerves, that Rue might be happier with only a human or two to manage. Big long lean gray mackerel tabby, spayed and vetted, loves attention, will leap into friendly visitors' arms. Such beauties. I hope they get forever homes soon. I had no idea torties existed when I was a kid. It's only after reading your blog that I realized Kitty was a tabby/tortie. I always expected my next cat to be a tortie - but then I met Miss Ellie. Then again, every cat is going to fall a bit short compared to Mudpie! Wow, 16 pounds of tortie! I hope these two find their forever homes soon. They're so beautiful! Hope they find good homes soon.